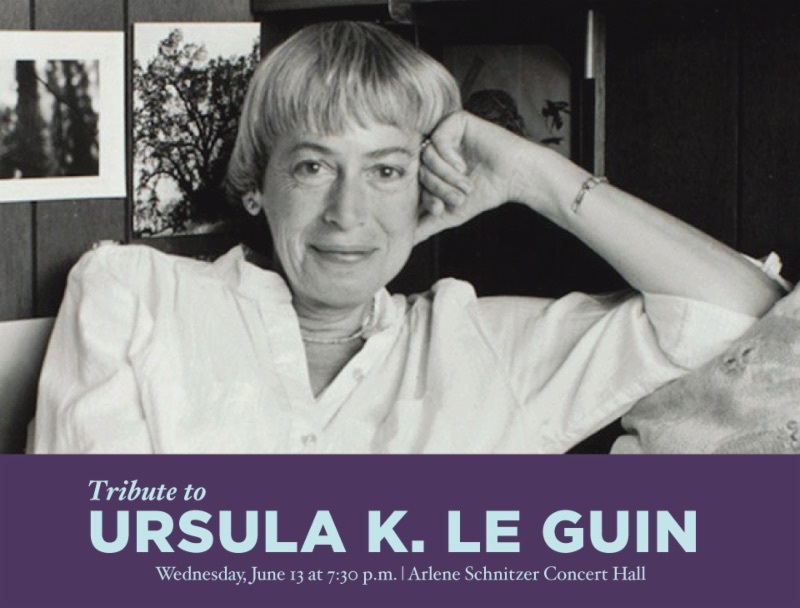 A tribute to Portland literary great Ursula K. Le Guin has been set for Wednesday, June 13, at 7:30 p.m., at Arlene Schnitzer Concert Hall. Fittingly, Literary Arts, with whom Ursula had a long association, has the honor of hosting, and you can sign up to receive a notice when free tickets will be released on May 1. Seemingly, everyone has an Ursula story. Mine? She was the centerpiece of one of the best and one of the worst days of my life. As I read the many homages about her soon after she died on Jan. 22, I tipped my hat a little and nodded knowingly, my innards pinched just a little more brittle, and then I went back to work, trying to squeeze the most out of the day. From major media stories around the world to short Twitter posts from literary giants, I read each one and thought a lovely howdy and then got back to bookkeeping and designing print materials because I had a deadline that mattered to no one but me. Most heart-warming were the personal memories from my friends and acquaintances. For all its population influx and blazing-fast construction of high-rise developments, Portland, Oregon, where Ursula and I have both lived for many decades, is still a small-town city and we all seem to be interconnected. People I knew posted interview links. Favorite books. Poems. Anecdotes of living room visits with her, living down the street, waiting on her at a cafe, encounters near and far. All were kind and lively and wise. And again, I read each one and then got back to depositing checks and preparing for an interview. But then. 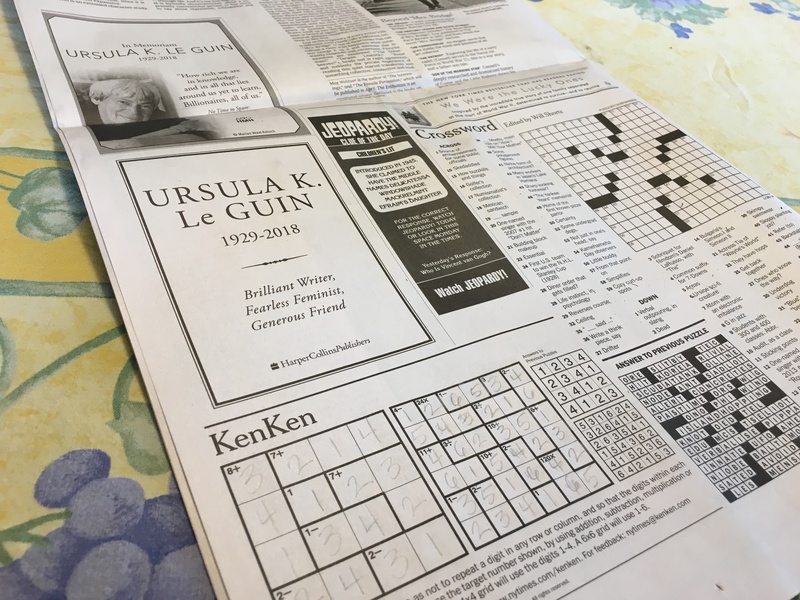 Then, at the end of the week, after a whatever morning of errands and walking and chatting and coffee and buying envelopes and picking up print materials and getting a headlight replaced, I kicked back to do my daily KenKen puzzle routine in The New York Times. I love my KenKen routine. College Boy turned me onto it. It used to be only his thing, but after he left in the fall I tried a sneaky Mom Maneuver and filled it out myself to see what it was all about, perhaps just a little trying on his bigger shoes when he wasn’t around and getting a whiff of his wishful here and now, and now I can’t stop. The KenKen, that is. When Grandboy visited I relinquished it to him, feeling a bit noble, but it was really the act that counted as a show of … well, you know … and he understood, I like to think. When College Boy came home during winter break I had to relent again and give up the KenKen, but a bright lightbulb lit up to COPY IT. So I copied the KenKen every day and College Boy and I both filled it out while he was home for five weeks, sometimes making a show of pounding down the pencil when we were done, or sometimes quietly putting it down and then GETTING UP from the table and WALKING AWAY as if yeah, no big deal – we reign supreme with the silent body language trash talk, though now that I’ve acknowledged and identified it, it’s possible I’ve sadly diminished its effect. When I finished first and exuberantly did the pounding-down-pencil College Boy sometimes complained about the noise and said it wasn’t a competition, which was either a sign of jealousy or that he had, um, stayed out late the night before, I was never quite sure, though it was probably both. Or perhaps I was being too obnoxious. … Nah, that can’t be it. When we visited my mom for several days she didn’t have a copy machine so we HAND-COPIED the puzzles ourselves and kept the duo streak going, kind of proud of the hardcoreness. Now I copy it for College Boy every day while he’s gone and save them for him. He kind of stays close that way. When The Vague They tell you to budget out college expenses – tuition, room, board, books, fees, transportation – The Vague They never mention copying KenKen. So then. Then, at the end of the week when Ursula died, I was doing my daily KenKen routine (which clearly is not a run-of-the-mill KenKen routine), taking a break from life, and I was partway through when I got a little stuck (only a little!). So as a distraction I looked at the Jeopardy question/answer, which appears as a little ad above the KenKen every Monday through Friday in The New York Times (I NEVER know the Jeopardy question/answer, except for that one time when, of all things, the question/answer was Edsel or, as is the silly custom “What is an Edsel?” But then, who am I to question silly customs?). And there. There, just to the left of the Jeopardy ad, was Ursula. Again. Inescapable. Her publisher and someone else – her agency? – bought ads memorializing her. The Freaking New York Times. The ONE PAGE in The Freaking New York Times that I was working on. Ursula was there on my dining room table. In the middle of my quiet respite of a KenKen routine. When I wasn’t paying attention to the rest of the world even though I had a major newspaper in front of me. This was my KenKen time. This was not my Rest of the World time. But there was Ursula. And I sat for a bit and flashed back to my one day with her, all I have, so meager it’s embarrassing and I didn’t offer it up even when I was prompted in front of a group of friends the day the world learned of her death. Maybe it was just too complicated to sum up quickly. As I sat there in front of the unfinished KenKen, my one anecdote that I’d ignored all week spooled out hard and fast, a long-ago lightning rod of a day for me, forever burn-marked as one of the best and one of the worst of my life. Sure, everyone else has warm living room and poetry anecdotes of Ursula, she-giant, brain-big, badass tales of her, but, typically for me, mine involves being stuck in traffic, lost reading glasses, and … pickles. I was charged with driving Ursula to and from a dress rehearsal. I can tell you the exact day, the day of the week, the time, and what I was wearing (bizarre, I know, but again, burn-marked), though, you’re welcome, I’m not going there. It rained nonstop. I got to her house early so I parked a few doors down, checked my BLACKBERRY (there’s a time-stamp for you), only to discover that we had a ticket issue for the concert that night. The website said we were sold out when in actuality we had hundreds of seats left to sell even though we had Ursula Freaking K. Le Guin performing. The website wasn’t my problem, but it WAS my job to sell those seats (and clearly I was failing miserably), though I couldn’t deal with the ticket issue right then because I needed to be knocking on Ursula’s door. In the car, she immediately started to apologize for missing a phone call with a reporter because she had a sudden conflict. I was confused about what she was talking about, unaware of this particular interview, assuming it was for another matter, and only later put it together that she meant a key opportunity to promote the show. At a major media outlet. Of course it fell through. What had possibly gone right? I could tell her mind was racing and she was trying to refocus, to calm herself. She explained that she should have been resting all morning, knowing she had a long, demanding day with a dress rehearsal and then the performance that night, but that she had spent it emailing. She had so much to do. She was fighting Google about plans to digitize books and was leading a petition for famous authors everywhere. She had one week to go. She had recently resigned from the Authors Guild over this, causing a huge stir. She didn’t explain these details, she wouldn’t have, and she didn’t need to because I already knew. She was making headlines around the world and yet she was in my car at this moment telling me the timing for this concert was just not the best. Worried about her stamina with hours ahead of us, and putting my ridiculously small fraught world into sharp focus, I really just wanted to put my face on the steering wheel and cry. It was about that point, or perhaps as soon as we left her house, that we hit road construction, after traffic delay, after road construction. Did I mention the nonstop rain? I watched the car clock tick by. This was not the time to get into a deep philosophical discussion about anarchy or anything for that matter because she had energy to conserve. You know, I tried, we have a mutual friend … She knew, cutting me short. My husband … She knew. I … She knew. She wasn’t being curt, it’s just that it wasn’t necessary, and she had other things on her mind. She mentioned enough, to my surprise, that it was obvious she already knew about me, or at least as much as she wanted to know, and I knew about her headlines so we sat there. Silently. Stuck in traffic. I continued to watch the car clock. I am OCD about trip planning. I had allowed a generous 45 minutes to get from her house to the concert venue, figuring we’d arrive 15 minutes early, but it took us almost an hour. Not that it mattered because the dress rehearsal was running overly long (of course) and the schedule was way behind, and Ursula had to sit there for at least a half-hour, probably longer, before she went on. The drive back to her house wasn’t any shorter, no matter what way I took, in a POURING rain, a hard, vicious, monsoon rain. Mostly we drove in silence punctuated with occasional impatient sighs because Ursula needed to save her voice for that night. But about halfway back, still crawling in the blippin’ worst traffic, stopping at every single red light, she suddenly piped up with something light and funny. I instinctively sensed she was taking pity on me, feeling a little guilty herself. You know, I said, ever since I started to promote this show, every time I talk to someone about it, they tell me a story about you. We talk business and then there’s this expectant pause. I’ve grown to recognize it, to anticipate it. That radio producer? She has a favorite book. You probably get that a lot. There was the spellbinding speech from the ’70s. Or maybe it was the ’80s. That photographer back there? You wouldn’t know it, but English isn’t his first language and he said he learned it by reading your books. I eventually – eventually – dropped off Ursula, then I had to swing by the office to pick up something, go home, change quickly, and get back to the concert venue. I arrived late, of course. I had probably spent three hours in the car. When I got there I realized I didn’t have my phone. A colleague opened a closet door and there I was, squatting down, frantically rummaging through my purse. Concert-goers actually started showing up. A few, at first, and then more and more (in total, not as many as I had hoped but not horribly embarrassing, either). And just when the lobby and the hall were packed with people and I was attending to one question and then another, Ursula’s and my mutual friend came up from behind, took my elbow, and quietly whispered in my ear that Ursula couldn’t find her reading glasses. Ursula was reading a text and without them she couldn’t perform. At least not well. By gobsmacking good luck, a neighbor happened to be volunteering as an usher (OK, I strong-armed her, but it didn’t take much – free tickets can make a good lure), and I knew that she stashes several pairs of reading glasses in various places around her house, in her pockets, in her garden (I’m pretty sure). She was only feet away. She took some coaxing, but after I explained, she wordlessly handed over her glasses. I had to promise promise promise that I would return them … and read the program to her. Right after the concert, I looked for Ursula in the green room, but she and those glasses were gone. I went back to the auditorium and a performer friend introduced me to Richard Zeller. Richard Freaking Zeller. Baritone. Metropolitan Opera, among other renowned companies around the world. Warm, funny, articulate, Richard launched into his own Ursula story. He was a superfan, knew all her work, and went to every reading he could, usually with a pile of books for her to sign. You can’t miss Richard. He is big and tall, a commanding presence. He was at that anarchy reading a week earlier, and confirmed that Ursula, was, in fact, on fire, and that the huge crowd was nuts. It was made clear before the speeches that Ursula wasn’t going to sign any books. She finished her speech and then handlers quickly escorted her out and down some stairs. Richard could see all this over everyone and then he recognized Ursula’s husband, Charles Le Guin, craning his neck and looking worried that he couldn’t see where Ursula went. Richard parted the crowd, made his way over to Charles, and offered to help lead him to Ursula. So like an offensive lineman, Richard broke through the crowd, with Charles in tow, and took him down the stairs. Richard spied Ursula across the way and made a beeline for her, but he’s so big that Charles was dwarfed and hidden behind him. Ursula only saw Richard barreling down on her, the guy who showed up at all her readings with a pile of books. She had this alarmed look on her face, started waving him off, and Richard had to put up his hands, step aside, reveal Charles, and explain that he wasn’t really a stalker but was just trying to help. Richard Freaking Zeller, who performs in major opera and symphony companies all over the world, had to explain that he wasn’t a stalker. Richard walked with me and my performer friend to our cars and continued to chat. It had stopped raining. He held a flashlight while I looked for my phone, which was black and face down on the floor of my car. Richard Freaking Zeller helped me find my phone. The next day or so, just when I was starting to fret about how I was tactfully going to get back those glasses, I had an email from Ursula apologizing profusely that she had them, and we set up a time for me to pick them up. When I arrived, she held one greasy hand awkwardly and explained apologetically that she had been making meatloaf. It seemed clear that she had intended to just hand over the glasses with one hand and close the door again. But I held up a quart jar of homemade pickles for her, and after a moment of frustrated uncertainty when she realized she couldn’t grab the heavy jar with one hand, she excused herself to wash her hands. She came back, took the pickles, handed over the glasses … and an envelope containing a hand-written thank you note for my neighbor. She said don’t tell her that she found her own glasses in the bottom of her bag after all and didn’t need them. 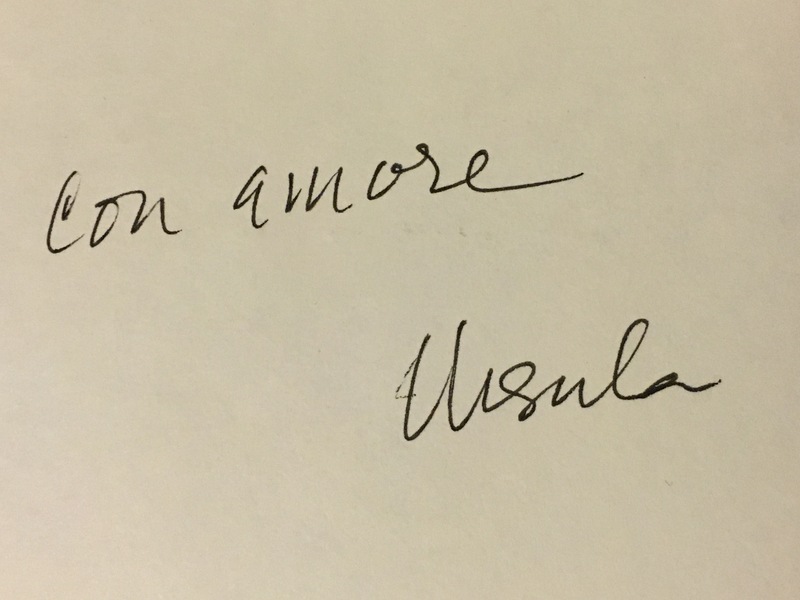 A few weeks later an envelope came in the mail with Ursula’s unmistakable tidy script. It included a check. She had donated back half of her concert fee, a sizable donation for our small organization. And it came with a note. Oh, those little notes mean so much, don’t they! Thanks, Lynne! You’re the best! This is lovely, thanks very much, Laura from um, the mutual friend. Thanks, Martha. I knew you’d recognize yourself in there.